Lincoln Recruitment Specialists are delighted to announce the appointment of Gavin Hayes as a Senior Consultant on our Insurance team. Gavin will head up our insurance division and brings a wealth of experience to the team. He has worked in a number of areas within the insurance sector including claims, sales management, training and development. 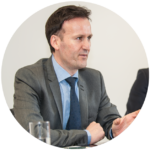 Prior to joining Lincoln, Gavin worked in the insurance industry for over 14 years and his substantial understanding of the management and training of staff, in conjunction with his superior knowledge of the insurance marketplace, means he is ideally positioned in advising professionals and clients in this industry. Our insurance division is an exciting area of growth for Lincoln and focuses on the sourcing, placement and management of contract and permanent insurance professionals for clients in the Irish market. We are extremely pleased to have Gavin on-board and his vast experience and knowledge of this sector will be invaluable in leading and supporting our dedicated insurance team.